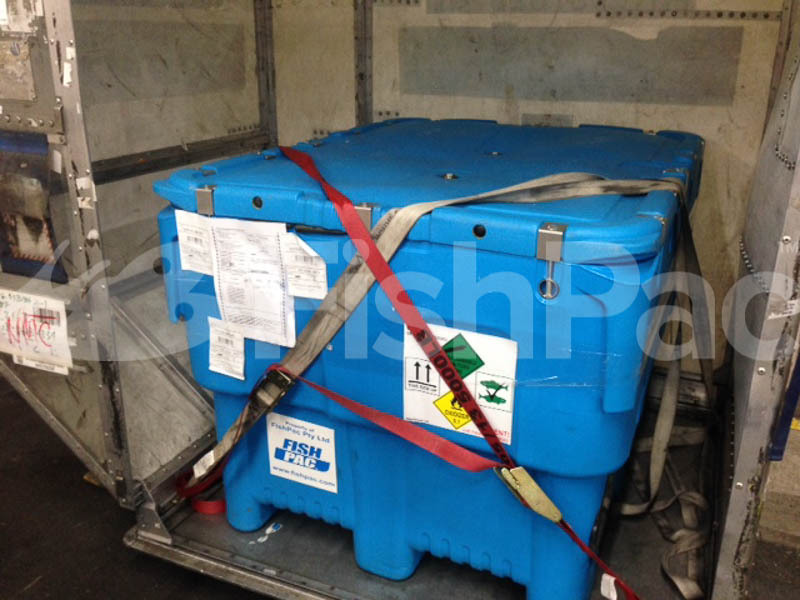 FishPac air freight live seafood transport systems is the world’s only IATA approved air freight oxygen delivery system, providing 21st Century air freight transport systems for a variety of live seafood. 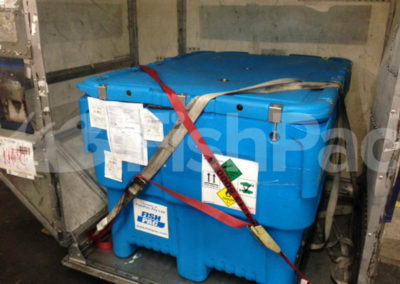 FishPac transforms live fish transport & live aquatic air freight transport. 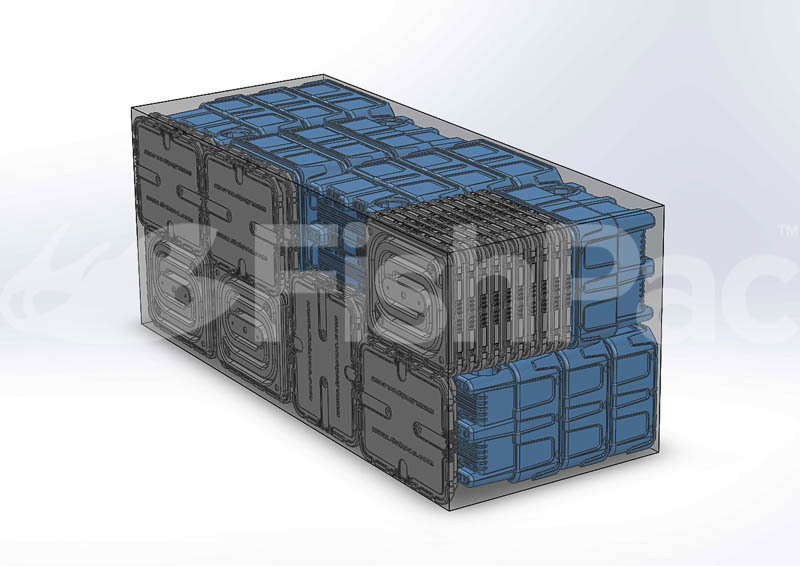 The patented FishPac™ system has revolutionised live fish transport. Launched in 2000, this Australian made end-to-end solution has uplifted more than 250,000 bins/totes between Australia, Indonesia, Maldives, Japan, Canada, USA, Asia, Iceland and Belgium, with each tote containing up to 600 kilograms of live fish and marine life. The innovative StackPac system is the only bin of its kind approved by airlines around the world, providing an average of less than 1% mortality rate across 30 hours ++ of transport. The result is a much higher payload from your air cargo space, transforming traditionally high risk / high reward business opportunities to low risk / high reward business opportunities. Since the very first FishPac shipments in 2000, our technology has been responsible for the delivery of more than USD 10 billion dollars in live aquatic animals. 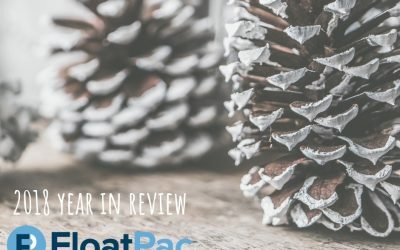 Most importantly, the FishPac technology has saved over USD 2 billion dollars of live aquatic animals from perishing through our low mortality, high success FishPac system. The central focus of the entire FishPac system, our patented, dual stage regulator is the only one of its kind in the world. 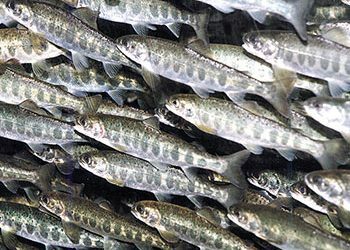 Fully approved under ICAO regulations special provision A302, the FishPac regulator has been responsible for the continuous flow of oxygen in over 250,000 shipments of live seafood. Safety is built into every aspect of the FishPac regulator, and there has never been a single reported incident with our regulator. Available exclusively through FloatPac, the FishPac dual stage oxygen regulator is the answer to your live seafood transport requirements. 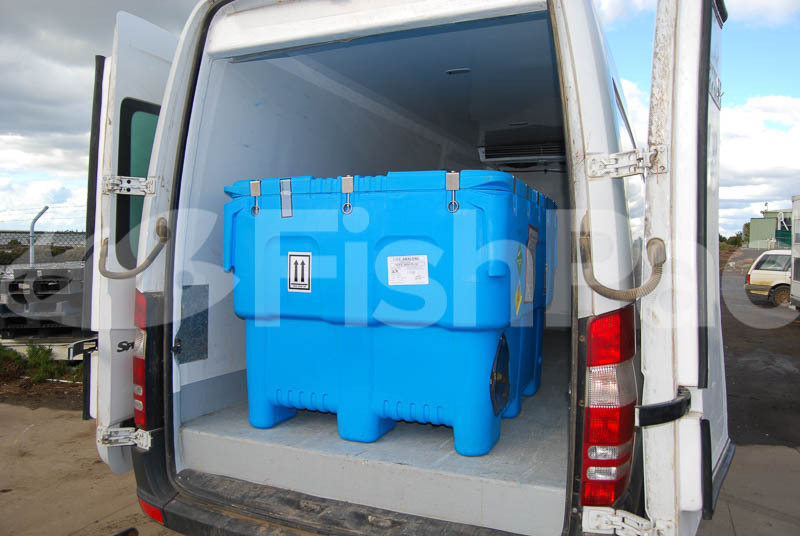 The worlds first truly live fish transport bin, the StackPac bin provides a level of versatility and flexibility in use that is unparalleled anywhere in the live seafood industry. Designed specifically to suit every up loading device in the aircraft industry, our StackPac bin meets all ICAO SP A302 requirements, and can safely transport up to 600 kg of precious live seafood cargo. Fully stack-able, the StackPac bin also maximises return freight capacity of empty bins, helping to reduce overall freight costs, whilst increasing bottom line profits for operators. 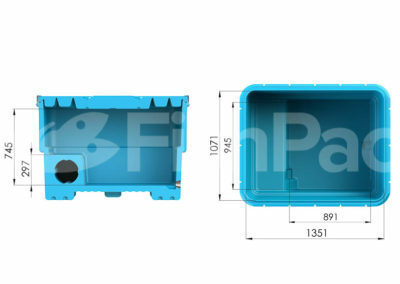 Available exclusively through FloatPac, the StackPac bin is the perfect companion to the FishPac regulator system, together offering an incomparable live seafood freight system to a variety of shippers. 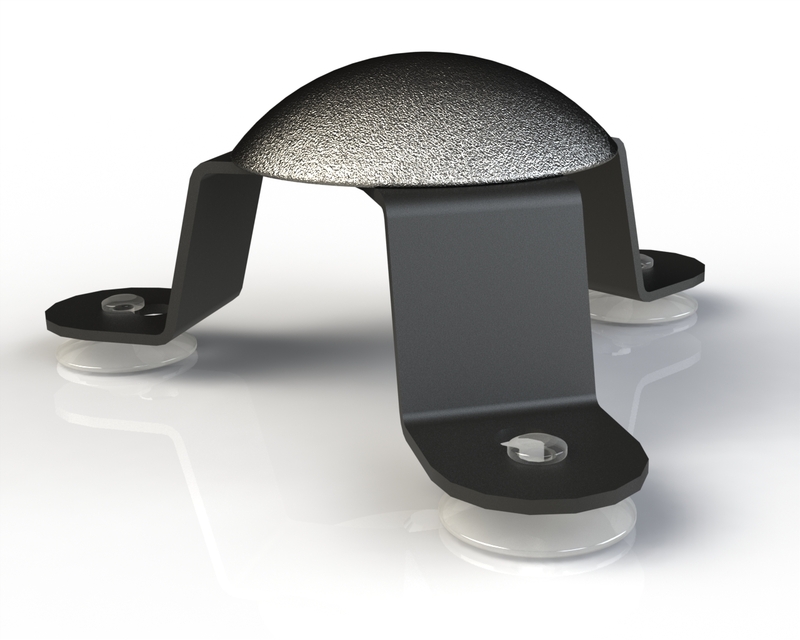 Developed exclusively by FloatPac to service FishPac clientele, our titanium diffuser offers an unrivalled level of strength, the likes of which before have not been previously available to live seafood shippers. Allowing the true delivery of anywhere from 0.5 – 3 litres of oxygen per minute, via 0.2 micron bubbles, the FishPac titanium diffuser completes the FishPac offering, ensuring the safe delivery of live seafood thanks to high levels of dissolved oxygen, whilst also helping to alleviate the build up of CO2 during transport. A regulated supply of oxygen for up to 40 hours (depending on species and payload shipped) can mean a mortality rate of less than 1%, which means greater return for your company on each shipment. Low stress levels also mean a higher quality fish at the end of the journey. This translates into longer shelf life and therefore better returns for your clients. FishPac handles every part of your live aquatic transport process from obtaining all the required airline approvals and documentation through to networking you with all relative freight services to ensure your cargo gets to its destination first time, every time. FishPac can even help you establish local relationships and the process of new market development. Built in fail-safes and vigorous safety checks during the manufacturing process have given FishPac a No Fail Safety record across more than 250,000 international payloads. Regulators are checked before every use and serviced every six months. Each StackPac container is tilt tested according to strict aviation regulations. The FishPac live air transport system is the only oxygen transport system approved by airlines and authorities around the world. 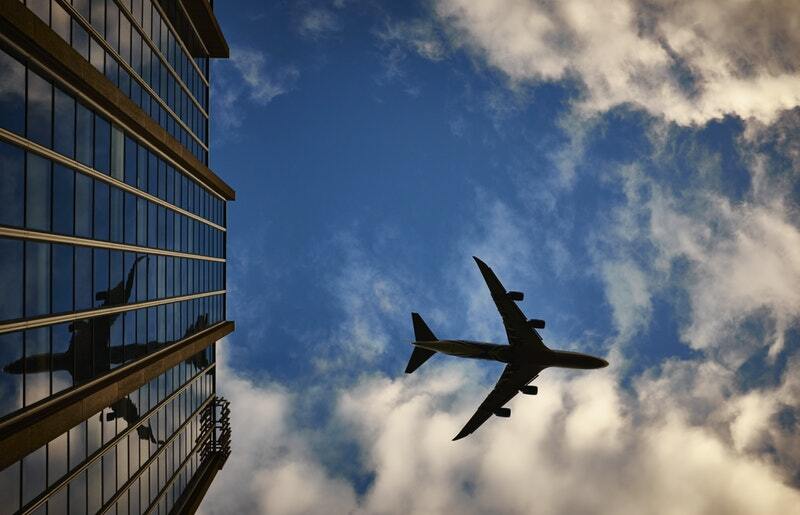 Authorities include: CASA (Australia), USA Department of Transportation, Transport Canada along with the following Departments of Civil Aviation: Singapore, Indonesia, Maldives, New Zealand, Japan, Hong Kong, China, Taiwan, Philippines, Iceland, Belgium. While the FishPac regulators are all leased, you can choose to buy or lease the FishPac containers (conditions apply). 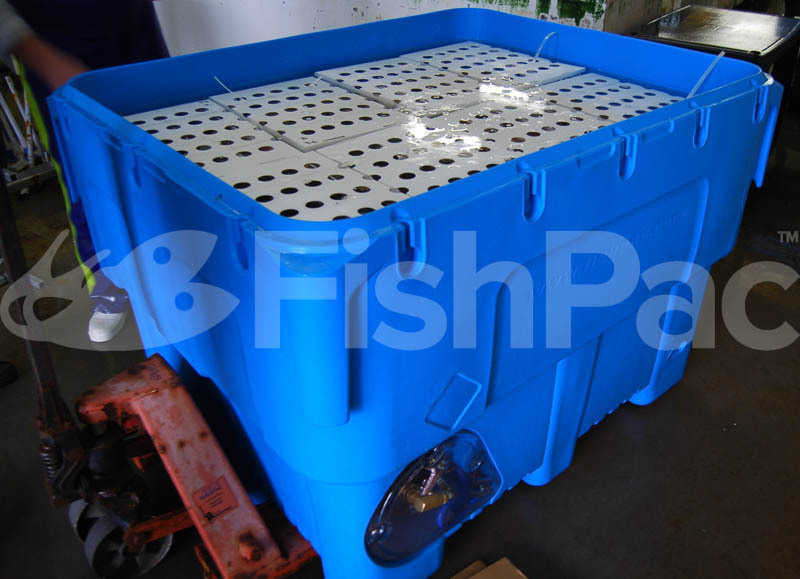 While a large percentage of live aquatic transport is of fish and fingerlings, FishPac containers are suitable for other marine life such as sea urchins, lobsters, abalone, prawns, and even larger aquatic animals for marine parks. 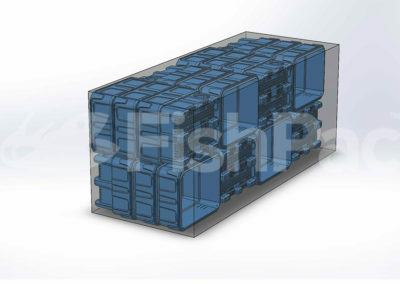 FishPac support the sustainable transport of live fish with an environmentally friendly process and materials. 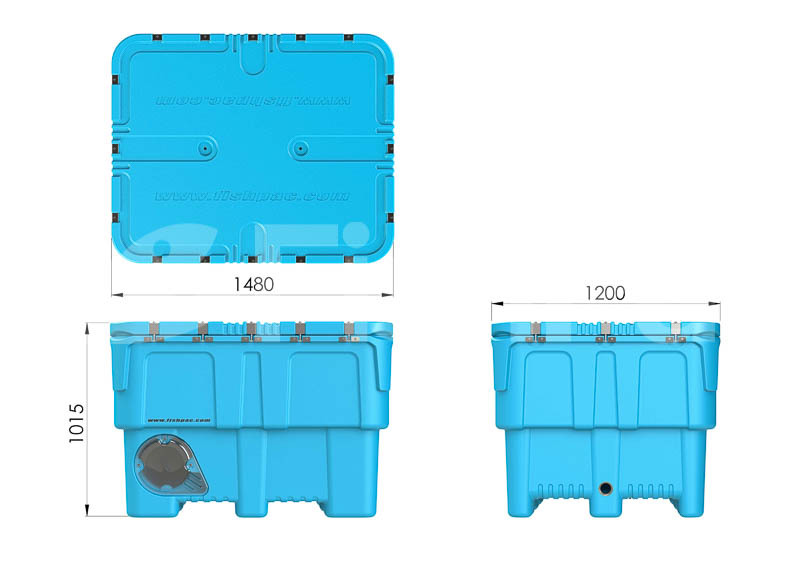 Your FishPac container can be reused for up to 20 years making it cost effective and environmentally sustainable. FishPac will eliminate use of the environmentally polluting Styrofoam boxes. 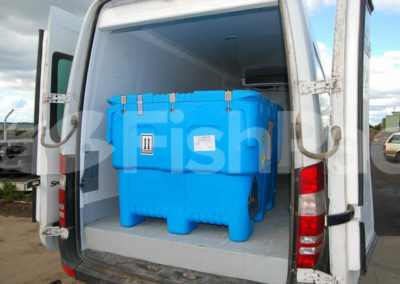 FishPac maintain the transport bins on a regular basis so your operators and shippers have nothing to worry about. Regulators are checked for every shipment and serviced twice a year and the containers themselves have no moving parts making them high efficient to operate and maintain. The heart of the FishPac design is the patented FishPac regulator. 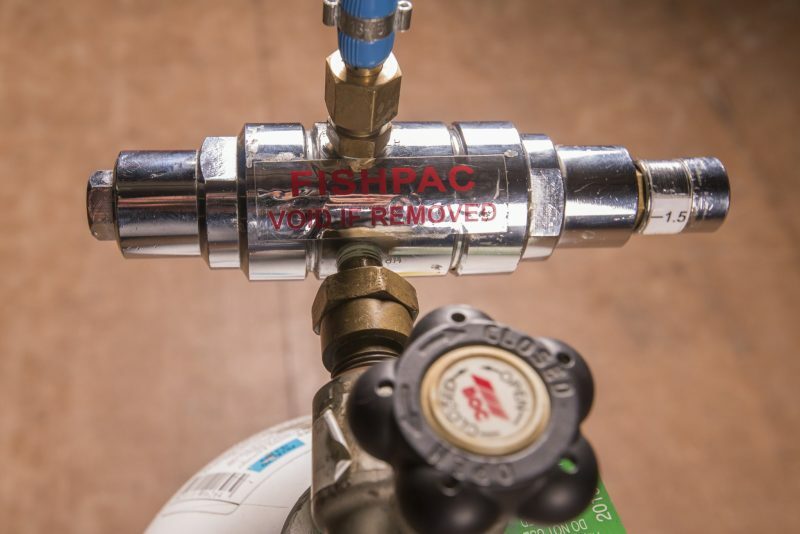 Oxygen flows from an approved oxygen cylinder through the FishPac regulator creating a controlled flow of between 0.5 litres – 4 litres per minute. The oxygen is then dispersed via a ceramic diffuser positioned in the bottom of the bin/tote ensuring the contained aquatic life can be safely sustained for 30 hours or more. The oxygen cylinder and regulator are secured in a sealed compartment in the base of the StackPac container while high density foam in the walls insulates the cargo against temperature fluctuations. Self-sealing devices are fitted to prevent any uncontrolled release of oxygen. Each container is vigorously tested for safety including tilt testing to 45° in each direction to ensure no leaking occurs during operation. Each patented regulator used in the FishPac StackPac containers is checked before every shipment. Biannual servicing and strict documentation requirements ensure each regulator is safe to use and transport every single time. 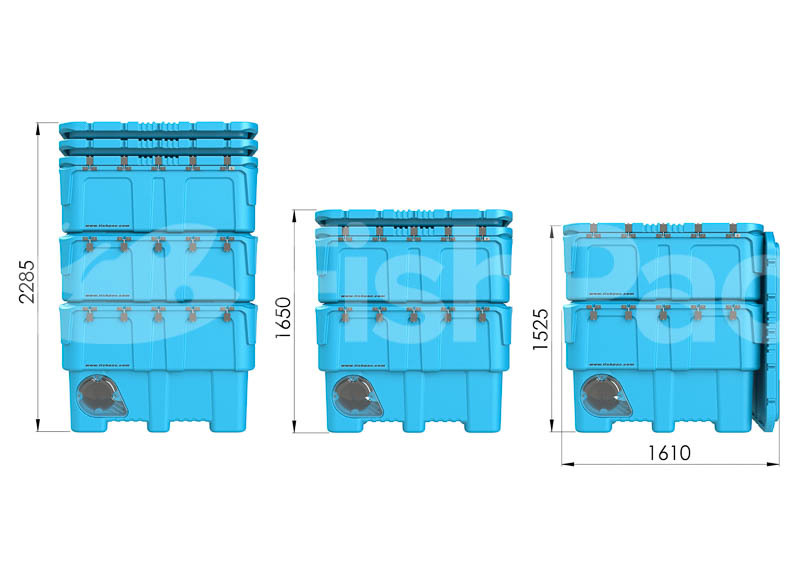 As the second generation FishPac tote, the StackPac has been made more durable with a higher possible payload per container. The container opening is designed for easy filling and emptying and the unique sealing system provides a vacuum like seal around container lid. A in built anti-surging seamist System and gore vents safely maintain differential pressure and no leaks have ever been reported. transform your live seafood shipping business today. 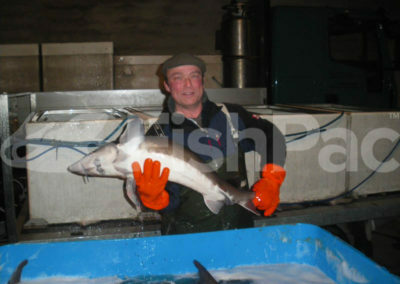 Happy fish, happy customers, happy clients! 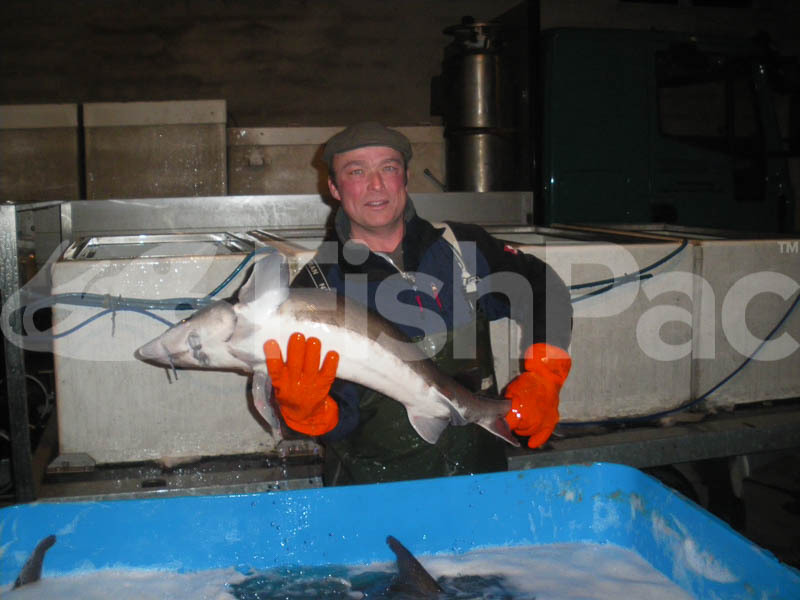 Yet more exciting news for the FloatPac family, with the first successful shipments of live salmon parr fingerlings, from Scotland to Dubai.